Police have finally handed over their investigation into 49ers DE Ray McDonald to prosecutors, who will decide whether or not to bring domestic-violence charges. But the real news is why it took so long. It's been more than a month since McDonald was arrested on suspicion of felony domestic abuse after an incident at a party at his San Jose home. The Sacramento Bee reported, citing police sources, that McDonald was arrested after police saw bruises on the neck and arms of McDonald's pregnant fiancée. The police's brief and only official statement said that "the victim had visible injuries." One of the things that complicated the case is that McDonald apparently called a San Jose police officer either before, or about the time that the 911 call was made and that officer went to the home. 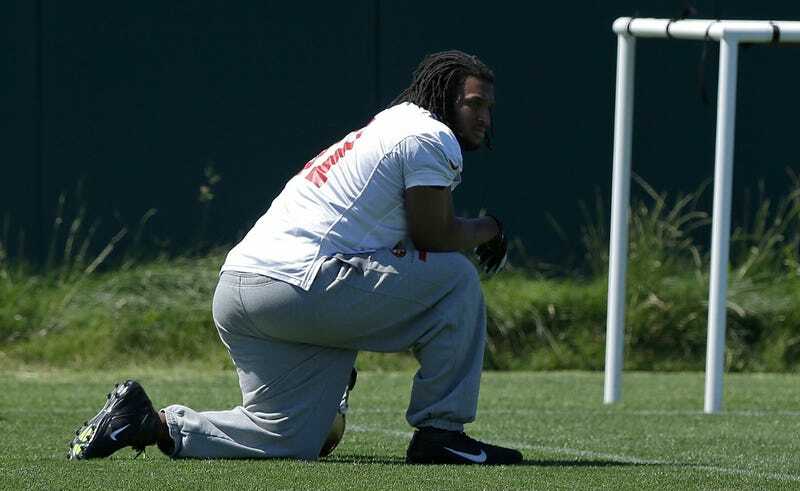 Reliable sources inside the police department said the officer also works as security at 49ers games. It was unclear if he was on duty or off duty at the time, but police sources said he should not have gone to the home and that he should have advised McDonald to call 911 if he didn't. This should probably be not much of a surprise. Team security is lousy with cops, and players—if they get into any trouble—are instructed to contact security first. If there was a problem here, it was in this specific officer putting his team commitments before, you know, the law. If the NFL has a problem with player discipline, it's that the league usually works either uncomfortable closely with, or completely outside the bounds of, law enforcement. Keep all this in mind as some league stooges call for Roger Goodell to get more involved, even going to so far as to suggest the league set up a private legal system. There is no time frame for prosecutors to decide whether to bring charges against McDonald.